For the first time in seven years, WWE aired an event for Louisville, Kentucky as the 922nd episode of SmackDown came from the KFC Yum! Center. 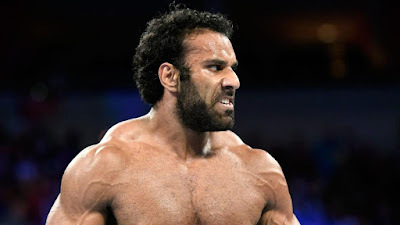 The main event would see Dolph Ziggler, Sami Zayn, Luke Harper, Erick Rowan, Mojo Rawley and Jinder Mahal (supposedly chosen by a random draw of some kind) battle in a Six Pack Challenge for a shot at Randy Orton's WWE Championship at Backlash on 21st May. Elsewhere the show featured AJ Styles, United States Champion Kevin Owens, Charlotte Flair, Baron Corbin and SmackDown Women's Champion Naomi in major slots on the card, but was it any good? Lets take a look. - SmackDown kicked off with Charlotte Flair demanding a title shot, because she was "fastly getting furious" with Shane McMahon. After SmackDown Women's Champion Naomi came out and got into a bit of a scrap with Flair, McMahon booked a match for later on where if Flair got the victory she'd earn a title match next week. - Backstage, Natalya, Carmella (with James Ellsworth) and Tamina were upset with Shane McMahon for offering Flair an opportunity, when McMahon no sold their displeasure, Natalya said she had a plan. Okay, so Jinder Mahal is Number One contender to the WWE Championship. He pinned Sami Zayn to earn himself his first title match since he challenged Seth Rollins for the NXT Championship in 2012, with a little help from the Bollywood Boyz. Wrestling in 2017 feels like we've shunted onto some weird alternative timeline and there's no way of getting off. Whilst the match appeared to be completely randomly chucked together, with their only being arguments for Rawley or Zayn to be included (at least based of recent results), as a spectacle the match was a damn entertaining affair. There was plenty of big spots that made the most of the bodies in the bout, including multiple suicide dives from Harper, Rowan powerbombing Ziggler to the outside as well as Zayn hitting a tope conhilo on Harper and following up with an Arabian Press to Rowan. In isolation, there wasn't much wrong with this other than awkward slam thing by Rawley, but I can't help but mark it down for having no explanation why any of these lads were given the opportunity to fight for a title shot. It's something different, but could have been propped up with some more logical booking. - Following Mahal's big win, he cut a little promo about how he was going to prove himself, before WWE Champion Randy Orton slowly walked to the ring to confront his new challenger. The segment concluded with another Bray Wyatt promo on the screen, going over similar ground as his one on RAW and still not cluing us up to what a House of Horrors match actually is. - A short vignette on Shinsuke Nakamura aired, with a couple of former NXT superstars putting him over. - Baron Corbin crashed a Renee Young interview with AJ Styles, leading to a match between the two being booked as the main event. - It turned out that Natayla's plan was to bump in Charlotte Flair as she walked past her in the hallway, great work Natty. A feel with a little build, Flair v Naomi could have been electric on a PPV, considering how both have been presented on RAW and SmackDown since the Draft last summer and whilst we still got a pretty good match between the two here, it was a shame to see it thrown out there. With the two having a title match next week, I worry that WWE is already overexposing Flair in a similar way to how she ended up having WAY to many TV matches with Sasha Banks and Bayley on Monday nights. Inside the ring the two mesh together nicely, being able to match each other athletically and both bringing the fight and building the intensity when necessary. The back and forth chop and kick battle was very cool, as was Naomi's fire-up sequence and whilst some of the ideas didn't always come out looking as good as they could have (rana to the outside, Naomi's stunner thing) the two always seemed capable of recovering. The finish with Charlotte blocking the Rear View with a big boot to the back, before hitting Natural Selection, was nicely done, even if it felt a little more like a near fall than the actual ending. Naomi and Charlotte have a lot of potential together and once they're more familiar and cripsen up in the ring I'd expect an outing a few notches above this. Whether we see that next week or not, I'm not sure. - More awkwardness between Charlotte Flair and the odd group of rivals, Natalya, Carmella and Tamina. - The Colons (formerly known as The Shining Stars) won a quick match over American Alpha with a distraction finish. The bout did more for Epico & Primo than their entire run on RAW, but having them beat Gable & Jordan so quickly was a little disappointing. - A vignette of Lana dancing around a chair on the entrance ramp aired, she's coming soon. - The jumpy Dasha Fuentes spoke with Tye Dillinger, who introduce a video package about himself, which was nice of him. - Kevin Owens cuts a promo about being the Face of America, ahead of the first Face of America Open Challenge. - Kevin Owens def. Gary Gandy in thirty seconds, with Gandy almost completely botching a Pop-Up Powerbomb. - Kevin Owens cut another promo about being the Face of America and joined the commentary team for the main event. Austin Aries welcomed viewers to watch 205 Live after SmackDown on the WWE Network. Completing a trio of top quality TV matches, AJ Styles and Baron Corbin closed the show off with a physical battle, that saw The Lone Wolf more than hold his own alongside the company's 2016 MVP. The two worked a classic power v speed, brawler v wrestler, type contest with Corbin initially being able to keep up with Styles' pace and absolutely dominating the former WWE Champion, dropping Styles on the apron from a Fireman's carry position as well throwing AJ under the bottom rope and into the big thick ringpost. Just as Corbin showed he could match Styles for pace, we later saw that Styles could brawl like Corbin, as The Phenomenal threw a series of big strikes that resulted in a near fall. The presentation of both men as equally proficient at mixing it up in different styles could have really came into it's own later on in a longer match. After Styles found himself back body dropped onto Kevin Owens on commentary, the finish was a signal to just how high WWE are on Baron Corbin right now as Styles won by countout after sending The Lone Wolf over the barricade with a Phenomenal Forearm. Corbin really wouldn't have been hurt by losing to Styles by pinfall, even falling clean to a Styles Clash or Phenomenal Forearm, so the fact that WWE decided to have Corbin lose by countout goes a long way in showing just how big a star they feel big Baron could be. Three good TV matches and Jinder Mahal is #1 Contender to the WWE Championship. Is there much else I need to say here?